Welcome to The Bungalow on beautiful Fraser Island. We are located at Second Valley Eurong on the Eastern beach. The Bungalow is a leisurely 200m stroll to the beach and only 400m to Eurong Village with hotel, resort bar, bakery and shop. The Bungalow is a quaint two bedroom cottage, comfortably accommodating up to five people – perfect for couples or small families. The main bedroom has a queen sized bed with the second bedroom containing a queen sized bed and trundle underneath which fits snugly beside the Qbed when rolled out. The combined kitchen/living area is fully equipped with crockery, cutlery, pots/pans, gas stove, large fridge/freezer and television/dvd player. There is a separate bathroom, toilet and laundry area adjoining the kitchen. The house is solar powered and as such, small electrical appliances such as phone chargers are permitted. Hair dryers and straighteners, portable fridges and coffee machines are not permitted due to their large power requirement. The Bungalow is designed to suit our Queensland climate with a large open timber deck and an additional concrete undercover BBQ area, perfect for outdoor entertaining. The house is fully screened for your comfort with louvers throughout to capture cooling sea breezes and tinted for privacy. Please note that linen is not supplied and must be provided by tenants – sleeping bags will not suffice for linen. Tenants must supply their own sheets, pillow cases, towels (bath and/or beach), tea towels and bath mat. Pillows, pillow protectors, mattress protectors, doonas and extra blankets are provided. Check in is 2pm and check out 10am. Eurong Second Valley is a private enclave in a quiet bush setting protected by a dingo safety enclosure. Dingoes are part of the natural habitat on Fraser Island and it is recommended that children are monitored by adults at all times when enjoying the sights of the island. Tenants are requested to be mindful of residents and holiday makers in this quiet valley by keeping noise to a respectable level – especially at night and early morning. 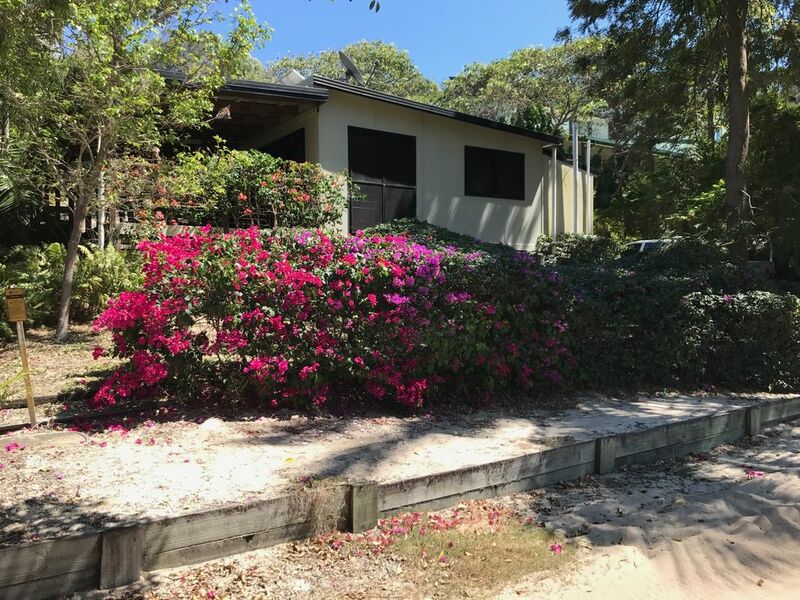 From the Bungalow, you have easy access to all the attractions of World Heritage listed Fraser Island, including the magnificent inland lakes (McKenzie, Birrabeen, Boomanjin), Eli Creek, Maheno ship wreck, coloured sands, Champagne Pools and further north to Indian Head. We hope you will enjoy your stay at The Bungalow. 4wd is essential on Fraser Island.